Tomorrow is the 18th birthday of Disney’s Animal Kingdom. There is a lot of history already in this park, and there are so many wonderful opportunities around the corner and stretching to the horizon for Walt Disney World’s fourth gate. Typically, this is when I like to do some sort of state of the park, go back to Joe Rohde’s talk on the evolution of the park, or jump out on a proclamation about how the park has so much to offer. While I will mention Rohde is just a little while, today I want to go much smaller and talk about a single corner of Disney’s Animal Kingdom. There are a lot of messages throughout the park, most deal conservation efforts. How to live in symbiosis with the world around you, finding value in and preserving the lives of the creatures great in small in your local and global communities, and the pitfalls that await those who choose to not heed the warnings in the world. Perhaps recognition and conservation are the key drivers in much of what is presented throughout Disney’s Animal Kingdom. For my part, however, I am inclined to find the underlying message that permeates through everything, a message of hope and of caring for one another. Sometimes that caring also means you have to care for yourself. 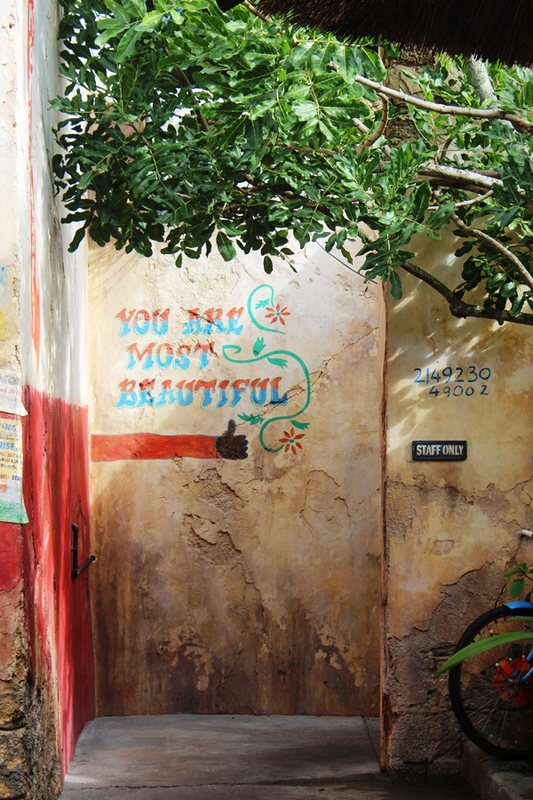 When Harambe Market opened last year, it gave a whole new life to Harambe. It brought with it more vendors, businesses, art, and information about the people and places of the area. Much of what could be considered to be graffiti spoke to the intrinsic value of we as a community of people and as individuals. Perhaps no corner of the market put it more succinctly than this one. It is a corner that lives in my heart, and is a constant reminder on my phone (with the missus standing confidently, if subversively, by the hand). I hope that when you wander by this small scene you take a moment and, whether or not you venture over to get a picture, find that thing in you that is beautiful and hold onto it. Carry that with you as you explore the rest of Disney’s Animal Kingdom. I promise you, you will see the park in an entirely different light. Hey Ryan, great write up! I am doing some research on the famous walls of WDW and this article really helps with the timeline. Speaking of that, do you know the time frame that Joe Rhode made the statement you quoted him saying? THANKS!